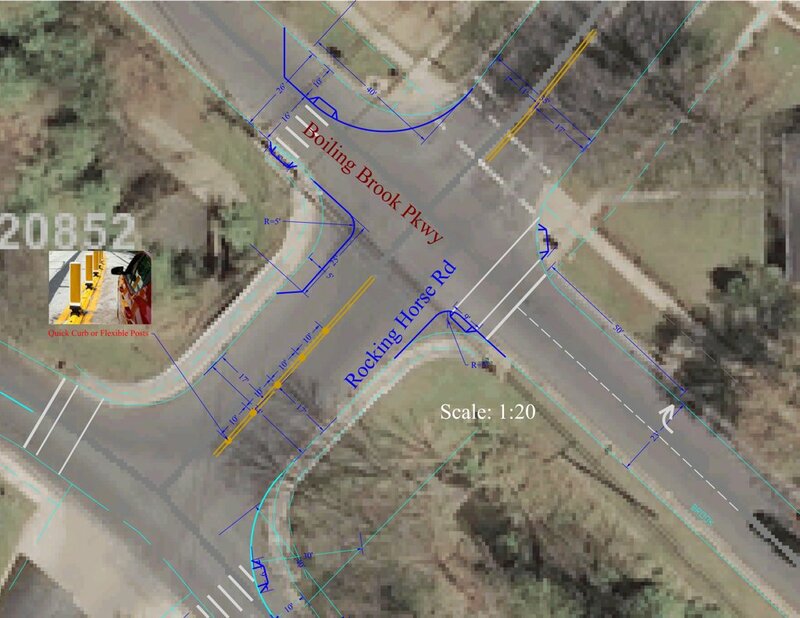 Updates to the proposed improvements for the Boiling Brook Parkway / Rocking Horse Road (BB/RH) intersection and the Boiling Brook Parkway / Schuylkill Road (BB/SR) intersection. Here’s some follow up based on community feedback for the BB/RH intersection. I asked about putting stop signs in the intersection, and MCDOT was open to the idea, but expressed concern that additional stop signs might make the intersection worse. They would consider this for a potential future improvement. Some in the neighborhood called for stop sign cameras, but those have not been deployed in the State of Maryland. I asked about signs indicating that the stop was a 4 way stop, but MCDOT felt the intersection was too separated for those to be utilized. I had a few requests for traffic lights at the intersection. The RCA commissioned a traffic study about 5 years ago, and the intersection did not meet the minimum traffic requirements to warrant traffic lights. MCDOT was open to conducting another traffic study at the intersection this year. I should reiterate that any changes will be made with temporary posts and markings, so they are reversible. 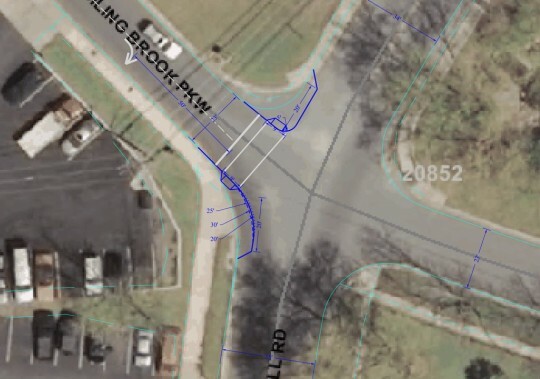 Per neighborhood feedback, the original plan was adjusted so that Rocking Horse Road as it approaches Boiling Brook will not be constrained to a single lane. In addition, the right lane on Boiling Brook heading towards Rocking Horse from Ashley will be marked with a right hand turn arrow. The RCA is also working on increased enforcement at this intersection, and intends to engage the Charles E Smith School on this topic. For the BB/SR intersection, minor changes were made by adding a crosswalk across Boiling Brook, though a crosswalk should also be added across Schuylkill Road. In addition, the right hand lane of Boiling Brook will be marked with a right hand turn arrow. Some folks questioned the need for the bump-outs at this intersection, and I shared that concern with MCDOT. The bump-outs are necessary to properly implement the new traffic pattern. That’s it for now; I’d encourage those of you interested in the discussion surrounding these intersections to sign up for the neighborhood Yahoo Group at http://randolphcivic.org/email. Thank you to those that are signed up and have shared their feedback. You may also share your feedback privately with me via email at chad@randolphcivic.org.